You and I may have different experiences, but definitely the same jubilant emotions, very same euphoric moments. Those few minutes of midnight that I spent in the singing van with multicoloured lights called "Ambulance" brought a new light of life inside me; I did not know I was changing to be a new person in those few minutes. ; I lost my voice for a minute; My closed eyes saw images of my mom and dad smiling; Only some tinkling noise of a glass bottle twined up with pipes to my arms, woke me up to catch a faint glimpse of the royal hospital exteriors; Yes the government hospital of Doha, Qatar, was nothing less than a royal palace. Happy Birth-days are not like the other 364 days. That's one day where we feel extremely special and want to pamper ourselves and celebrate the day we came into existence on this earth. The joys multiply when all our near and dear ones too join in to sing some notes. We all have a perspective towards birthday celebrations. Quietly slip off to a gateway destination, make some noisy party in our residences, or a quiet dinner with family and friends. Well, we would have tried almost all types. This month my little fellow turned 3. We decided to simply celebrate it in his Nursery with his buddies. The enthusiasm was not allowing us to fade it out into a simple one. And hence the preparation began. Goodies to all little children, the grand pink rose cake from Opera House (pink is my son's favourite colour) his new pink attire and a coat. 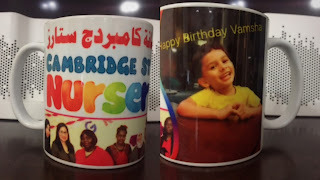 Ah, now this idea of the mug printing for his loving teachers. When all preparations were at our finger tips, finally the mugs were done too and arrived to be placed in the middle of a table in our drawing-room. That night, as I finished my chores and duties, and was about to put off the last pole of lamp light, I took a glance at those mugs shining on the table. The time of night triggered me to dive into some time capsule, reach out to those moments again. Those, of exact three years ago when he was born. One night three years ago, he was just expected yet. With a heavy baby bump when I had just pushed myself into a slumber did I wake up abruptly at witching hour of 2 AM. I knew, I just knew it was that time for him to arrive. I acted as quickly as like any chemical reaction, pinched my better half that was snoring softly on the other side of the bed. The ambulance arrived in like an instant "abracadabra". 7th minute I was inside the big multicoloured van with a singing siren, huffing, puffing and managing myself onto the smell of the liquids and other medicated stuff inside. Immediately I took to admiring the interiors of the ambulance. It was my first time. The nurse beside me asked several questions, took notes and offered some additional oxygen too. Those 12 minutes I spent inside the ambulance were a characteristic fair bit of an experience what I term as a perfect mixed feel times. The royal palatial hospital had a neatly manicured lawn and five-star facility. I was overwhelmed to see an Indian doctor on duty and gleefully sat up on the stretcher till the lady doctor sweetly ushered me back on stretcher and to a beautiful room but covered with huge heavy curtain from all sides of the bed. After an entire 18 hours of monitoring and my toiling up and down the hospital corridors with labour, finally the hard work paid off. I reminded the nurse with full confidence when it was time to rush to maternity ward and get the baby out. It was a first experience again to be on a bed completely surrounded by heavy curtains as is custom in Doha. The arrival of the bundle of joy lasted for few minutes till he was taken away for his wash and I lay staring at the ceiling and the tubes and pipes twined onto my arms. Just as I waited to ask the next staff when would the baby arrive to me, I witnessed it was almost 12 midnight and the mark of first day of holy month of Ramadan, and everybody got busy hugging each other and wishing "Ramadan Kareem". It was then, I took a chance to look at my coffee coloured maternity gown the hospital gave me. Intoxicated by the smell of medicine and the ticks of the big dirty wall clock, angrily I turned my face towards those heavy monstrous curtain, when I heard Usha Auntie run in like a happy puppy with a bundle in her hands. Look he looks just like his dad.. Enough, after all this labour and wait, and now at least I deserved to be told see how he resembles me. But too sweet that auntie was, I nodded a positive with her. Now as I arrived in to my private room, it was midnight and exactly a day after I had left home in the multicoloured singing van. And world had changed for us. There was an additional birth certificate added onto our family documents and one more passport to be done. Isn't birth of a human a joyful miracle coupled with emotions, changes and lots of memories for a lifetime's treasury?